Last night was one of “those nights” that I wish my boat disappeared and I was forced to buy an RV and drive around the world. Everything was fine after dinner and I crashed out hard in bed. Soon there after the wind picked up from the North, which I knew it would. I was living in some dream land I guess when I thought the small amount of reef would break down the surge and the anchorage would be decent enough to catch a nice evenings sleep. I mean coming from Panama where there were 8 foot waves crashing on top of a reef 100 yards away from where I was anchored and it was glass calm. Not so much here in the Bahamas. My sailing skills must be getting a little rusty. Around 1 A.M. the wind really picked up to around 20 kts and the surge came in heavy along with it. I got out of bed to make sure we didn’t drag anchor into one of the multiple twenty million dollar plus mega yachts anchored all around us. We were fine and I was nervous. This is when my anxiety kicked up a few notches, which is REALLY bad when this happens to me. I got back in bed and last all of about 5 minutes laying there. By this time I couldn’t stand it any longer. I had out 8:1 scope and waves were coming over the bow in the anchorage. I grabbed a beer, headlamp, and pack of smokes. Once topside I paced the deck incessantly for about five hours until the sun came up. I immediately started the engine, barely pulled anchor, and sailed out of the harbor and offshore. Anywhere but there at this point in time. I had the genoa out in about 4 foot seas headed downwind. A perfect sail to make it over to Staniel Cay and some protection. Just as I was getting everything straightened out and arranged Joana came topside to join me in the cockpit. I asked how she slept. She said not one bit all night long. That is kind of funny because I checked on her multiple times throughout the night to see if she was ok and she looked to be in dreamy land to me. Hmmmm…. Anyways enough of me ranting about how horrible my life is out here. Lets get back to better times. We arrived at Staniel Cay after the most epic downwind sail. 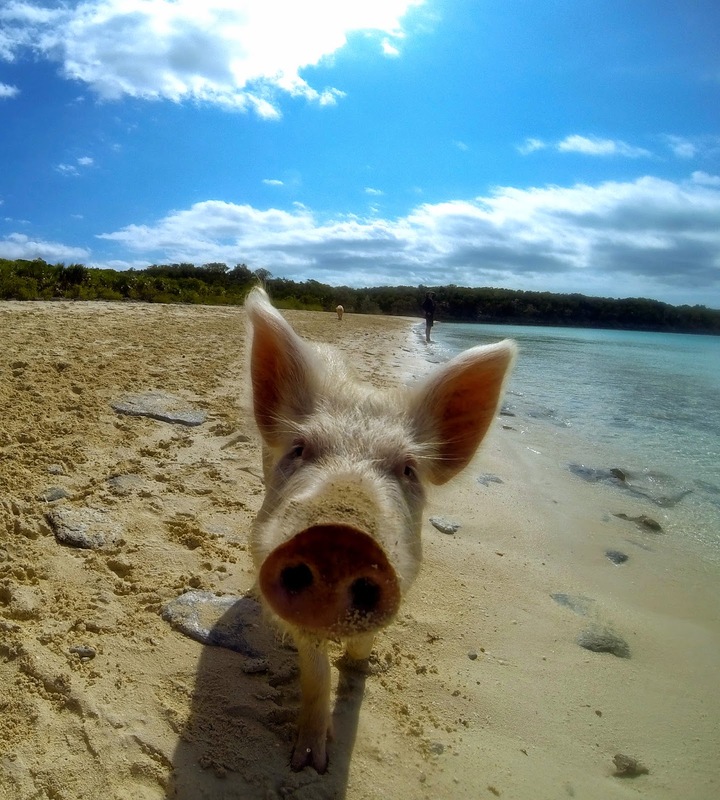 Sailed from harbor to harbor and dropped the hook right off of Big Majors (the pig beach). The rest of the day was spent exploring the nearby islands, playing with the piggies, and swimming in Thunderball Grotto. The highest of highs and the lowest of lows all experienced in a 24 hour period cruising the Exumas. Previous Previous post: BIRTHDAY TIME!